Black bears are featured in this panoramic scenic border print. 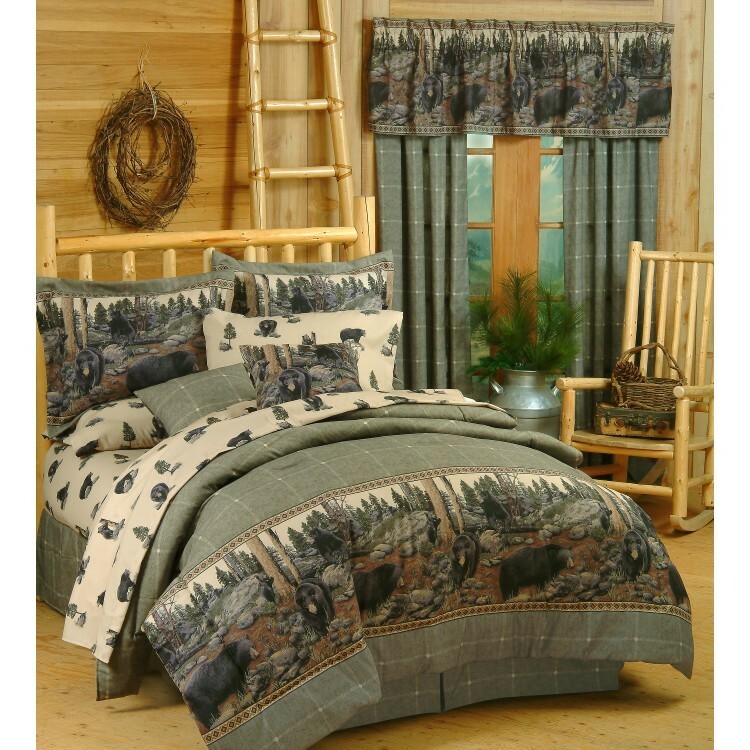 The field of The Bears comforter set is a soft sage plaid color. Detailed jump tack stitching enhances the comforter design. Comforters are over sized. This Bedding is made in the USA. The Bears Comforter Set features Black Bears in a panoramic scenic border print. The field of this comforter is a soft sage plaid color. Detailed jump tack stitching enhances the bedding design. Comforters are over sized. The accent pillow is 18 inch square with a bear image reversing to plaid. Sheet sets are 180 thread count cotton polyester percale and are machine washable. Made of 100% cotton duck, dry cleanable. All are made in the USA.